Hello there. I know that most of my neighbors are dodging snow storms on the East Coast. And I feel sorry for you, I do. But, it’s strawberry season here in Israel and I just can’t resist sharing some pictures from the shuk (market). 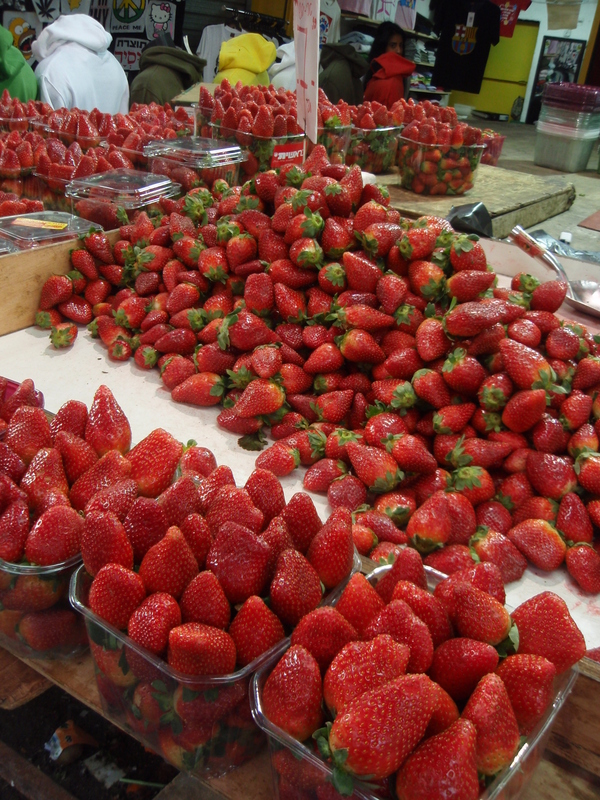 … I headed to Mahene Yehuda on Friday afternoon and was overwhelmed by the rows and rows and piles and piles of strawberries. Deep red, huge, and just oozing with juices. But for anyone who has never been to Mahane Yehuda, let me just tell you that it’s a zoo before shabbat. So much so that while I was able to snag a big bowl of berries, I didn’t dare snap a picture for fear of being overrun by the more serious shoppers. 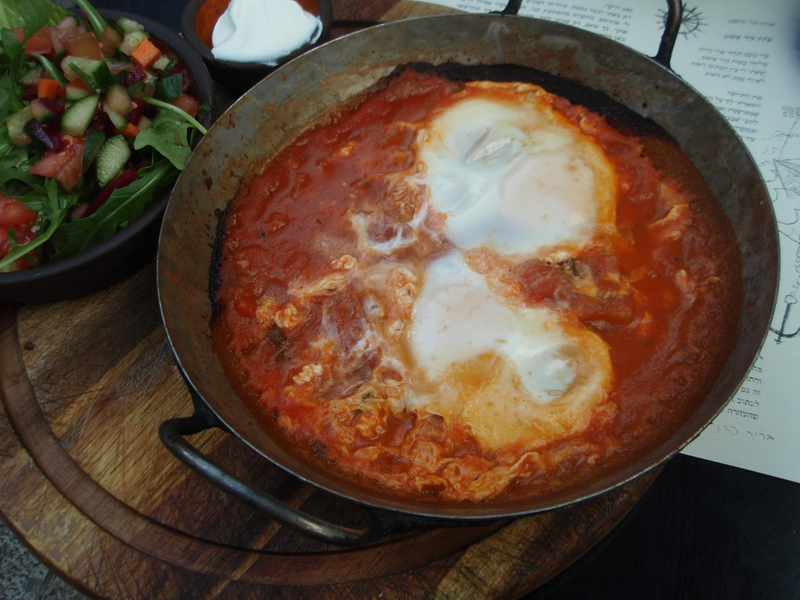 Luckily, a few days later at Shuk HaCarmel in Tel Aviv, I was able to grab a few more berries and get some pictures. As Winter so dutifully introduced itself to us here in the Northeast the day before the solstice with almost a foot of real snow in Boston (as opposed to the sprinkling earlier in the month), last week I found myself with a small surplus of Autumn fruit that I felt the need to use up. Persimmons and pomegranates nearing the end of their season beckoned to be used up before they perished. A potluck lunch for which I had committed to make a vegetarian protein main dish (what, no meat???) proved the perfect excuse. Prepare quinoa. Put 2 C quinoa, 1 tsp salt, and 4 C water in a medium saucepan. Bring to a boil, reduce to a simmer, cover pan and cook for 13 to 15 minutes, until water is absorbed. Fluff with fork. Turn off the heat and let the quinoa sit covered until it has cooled completely. Or just follow directions given with your quinoa (including whether it needs to be pre-rinsed). Roast walnuts. Roast walnuts in a dry skillet over low heat until fragrant (<10 minutes) — watch carefully to prevent from burning. Prepare remaining ingredients. Peel and dice persimmons. Remove seeds from pomegranate. Thinly slice the green onions. Make dressing. Mix together pomegranate concentrate, mustard, and vinegar. Slowly whisk in the walnut oil. Add salt and pepper to taste. Throw it all together. 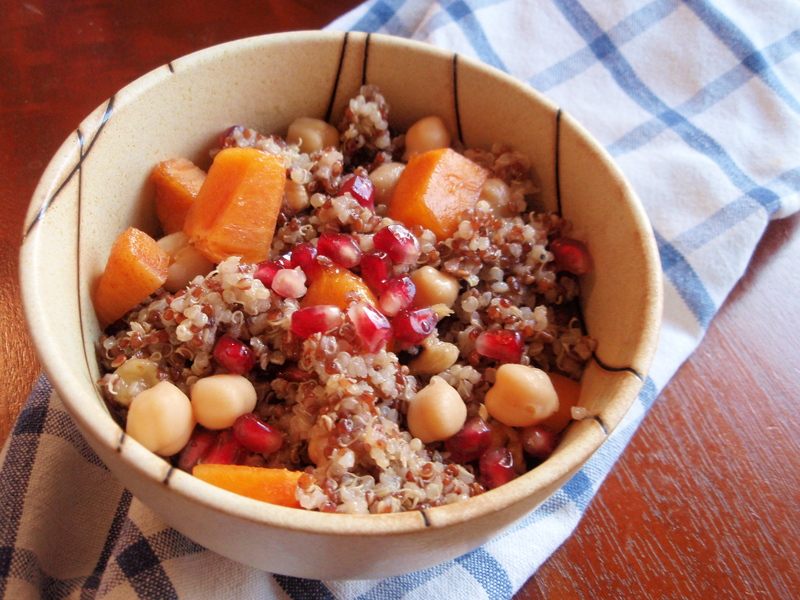 Once quinoa is cool, add chick peas (rinsed), walnuts, persimmons, pomegranate seeds, and green onion (reserving a few for garnish). Lightly toss with 1/2 dressing, adding more to taste. Snow always makes me feel like a little kid. Especially the first big snowstorm of each year. Memories of waking up to see the window sill coated white. Lying in bed, awaiting that early morning call from the phone chain letting my parents know that school was canceled. Sledding with friends in the park that was just next to my house. And of course, hot cocoa when we returned home, noses and hands chapped despite gloves and scarves. Then ready to head out for more. This year’s first snowfall was a bit of a letdown. Less than an inch but still sticking to the grass and sufficiently cold to cause traffic issues on black ice. Nonetheless, I slept in, bundled up in blankets and quilts, and had a nice indoor Sunday. And I realized that I could fight it no longer — soup season was officially here. So, my inaugural soup this Winter (oh, even writing the word seems like an admission of the season despite a couple more weeks before the calendar agrees) is a spicy butternut squash one. No sweet squash here — I always prefer main course types to be savory. And this one has a kick of spice that hits you nicely, keeping your cheeks and tongue warm long after the soup has reached your belly. Here’s to soup season and many cozy nights. Adapted from Simple to Spectacular by Jean-Georges Vongerichten and Mark Bittman. What I love about the cookbook is that it presents a limited number of dishes, each with five variations ranging in difficulty as the title suggests. 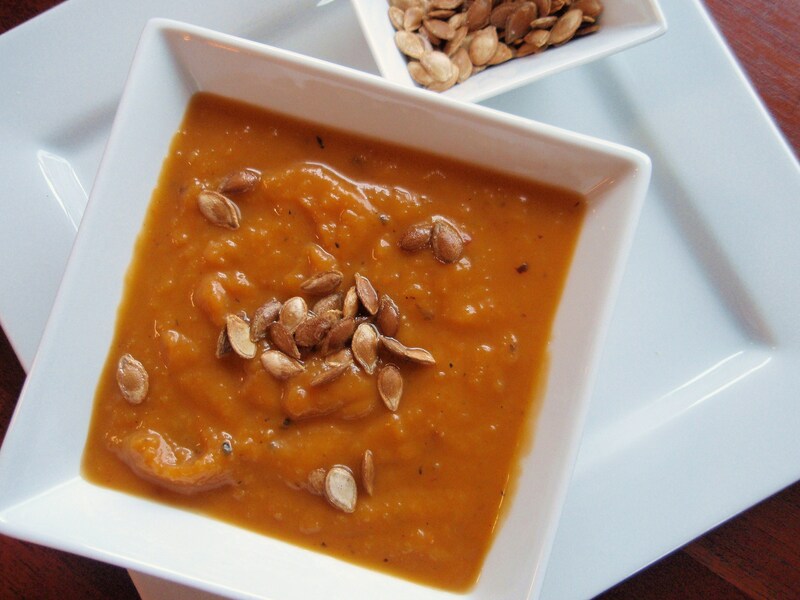 This particular recipe is second in the butternut squash soup repertoire. It calls for roasting the squash twice – once on the stovetop and once in the oven. When pressed for time, I have skipped the stovetop roasting with only a small drop in the richness of squash flavor. And don’t forget to roast the seeds — they taste a little bit like popcorn. Prepare the squash. Peel, seed, and cut the squash into 1-inch chunks. I would really encourage you to wash the seeds off and roast them. Pan-roast. Heat olive oil over medium-high heat in large skillet that will fit at least 6C of liquid — I have often done this directly in a large ovenproof pot. Add garlic, squash, red pepper flakes, thyme, and salt and pepper to taste. Cook the squash, stirring every few minutes until squash starts to brown. This takes 10-15 minutes. Oven-roast. Put the skillet in the preheated oven for about 15 minutes, checking and shaking 2-3 times. Back to the stove-top. Take the skillet out and put it back on the stove-top over medium heat. Add the stock. Cook another 15-20 minutes until the squash is very tender. Use an immersion blender to puree the soup. If it is too thick, add some water. Serve with some grated Parmesan or roasted squash seeds.